Subscribe-HR. Client News. November 2016. Hello everyone, we hope you're enjoying the spring sunshine and that you're prepared for the silly season that's just about upon us. The decorations are up in stores and office Christmas parties are just around the corner. Before Summer officially arrives, here's a rundown of the highlights from the last month. Customer of the month: Compass Corp.
Wellness at work, simple habits for a happy workplace - Don't sweat the small stuff. Main HR / System Admin user/s in your organisation. White Paper: HR Metrics Past, Present and Future. Congratulations to Anita from Compass Corp, who is this month's customer of the month! The team here at Subscribe-HR have been working with Anita during the implementation their system. Everyone would like to pass on their gratitude to Anita for her positive and proactive attitude during the process. In November, we've got another Wellness Habit for you. This month we look just how beneficial it is for your overall wellbeing when you don't sweat the small stuff. You can access this month's Wellness Habit by clicking here. 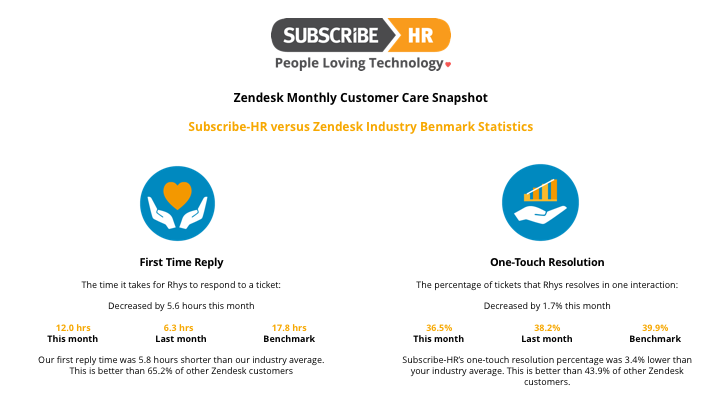 As part of our commitment to both improved Customer Care and transparency, we're sharing our key support metrics with you each month - as benchmarked against Zendesk's industry specific statistics (which they gather from across all the users of their Support software with businesses in the same industry as Subscribe-HR). Last week you would have received an email requesting that all you main contacts / account admin users complete a form for our records. The purpose of this request is to ensure that we have all the relevant / appropriate individuals on our comms list. This is important because when we send out system update notifications and other critical system related information to our customers, it ensures that the right people in your business receive that information. Maintenance > More Groups > Open up system administrator group > click on human resources > Check the delete row on the “employee” row. The billing section of your dashboard provides an overview of current system stats that is updated each month. Billing history shows information used for billing for each month. Please note that there are legislative reasons why you would want to keep records and this is why deletion is turned off as a default. HR Metrics is a perennially hot topic and we've just published a new White Paper about the evolution of HR Metrics, past, present and future. The White Paper was written to give HR professionals and Senior Executives an overview of past, present and future trends in measuring HR performance. It covers indicators and analytics used by organisations to measure HR performance in hiring, on-boarding, retaining and evaluating their talent. It looks at future trends with specific focus on employee wellbeing and how organisations can impact these areas to differentiate themselves as employers of choice. You can download the new White Paper on HR Metrics here.